>>> as the presidential campaign heats up, today was the deadline for the candidates to report on their fundraising for the last three months. beyond their messages, the race for money will largely determine how far the candidates can go. nbc's mike viquera reports. >> reporter: they say money isn't everything. but in politics it can be. >> we raised about $2.8 million. >> reporter: that's why new gop frontrunner herman cain went to tennessee. >> reporter: in the first big d disclosure day, cain 's numbers are coming up front. rick perry reports he took in about $17 million and has $15 million in cash on hand. behind is mitt romney , he raised over 14 million with about the same amount in the bank. then ron paul who raised 8.2. after that a big dropoff to cain 's 2.8. the totals are one important sign of a campaign's health and staying power . experts say the surging cain , who lacks the big organization and has refused to even name key advisors, must raise his money game as the first primaries approach. >> for him to be able to compete for a long period of time, he's going to have to raise a considerable amount more money to be able to fund an organization and to be able to fund those later tv ads. >> reporter: with the democratic field all to himself, president obama 's take dwarfs the gop contenders raking in 42 million for his campaign over the past three months. with more than 61 million in his war chest , experts say in the end it will be the costliest campaign ever. >> one of the advantage es the president has is the ability to raise money . i don't know if he'll get to 1 billion but he'll have plenty of money to spend to fight the republican nominated against him. >> reporter: one other gop contender michele bachmann divulged her numbers. about a million ahead of herman cain . one other aspect of this, lester, this year the so-called superpac skrkz, president obama has one. many times they don't have to disclose their donors. some people expect them to match the candidates dollar for dollar in their spending. it adds a whole new dimension to this presidential race as well with a lot more money. lester? 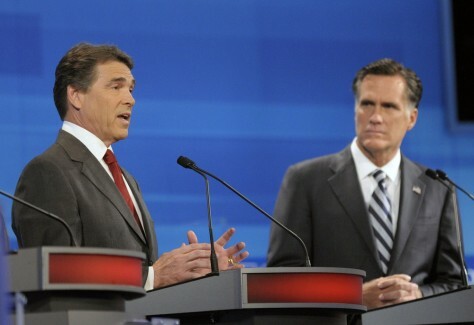 Republican presidential candidates, Texas Gov. Rick Perry speaks as former Massachusetts Gov. Mitt Romney listens in the Fox News/Google GOP Debate at the Orange County Convention Center on Sept. 22, in Orlando, Fla.